One great feature built into Voog is left unmentioned. We’ve set up our own search engine in Voog that indexes your site and provides everything needed for your visitors to find content blazing fast. Every stock design in Voog will have a search box built right into it. We’ve even made the look and feel of search results to match the style of most stock designs so they feel right at home. Designers and developers who want to bring their own designs to Voog can use the Search API to integrate search into their own sites. Documentation for this can be found at our developers site. You can turn the site search on or off for your site at Settings > General > On-site search. You can see our search in action at our support site. Feel free to try it out and let us know what you think. 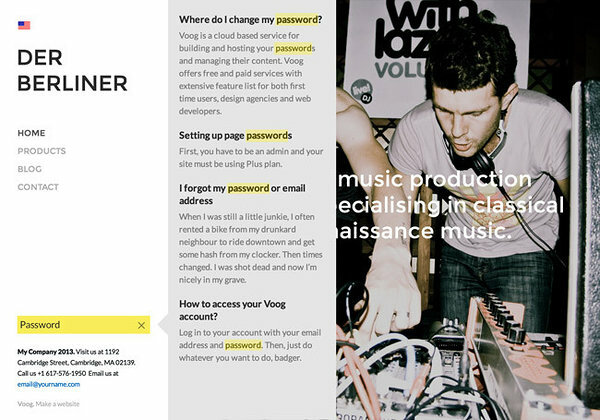 Tanel is in charge of the pro tools at Voog, both for the development community and our internal use. Tanel is one of a rare breed — an empathic developer.